The Legal Resources Centre (LRC) is proud to inaugurate the George Bizos Human Rights Award. 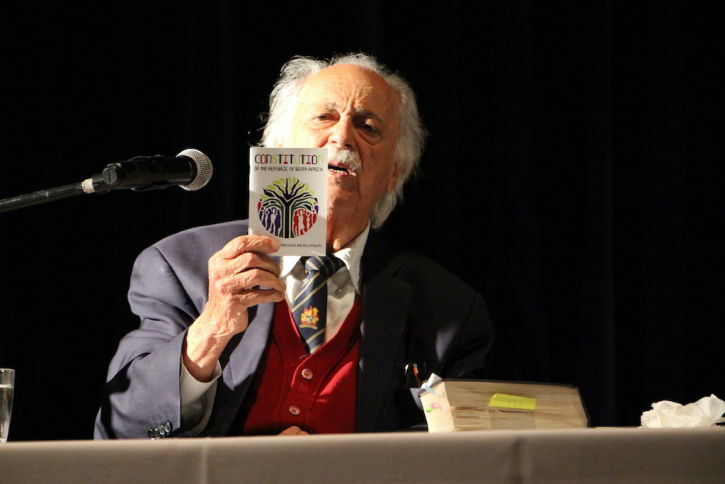 The George Bizos Human Rights Award, which will be presented annually, seeks to recognise those making a remarkable contribution towards protecting, upholding and advancing a culture of human rights in South Africa.The LRC hopes that this Award will serve as further inspiration for human rights lawyers and all those who work tirelessly in the public interest. In launching this Award, the LRC will recognise the man - George Bizos SC - himself: for his outstanding work and unwavering commitment to holding those in power accountable for any abuse, towards South Africa’s constitutional democracy and for the realisation of the rights that are enshrined in our Constitution. Through the Award, we will also celebrate the life of Uncle George, as he is affectionately known by his friends and colleagues, and his dedication to the country’s journey to freedom. Through his life and career, George Bizos SC has played a pivotal role in shaping South Africa’s much-praised constitutional democracy. A stellar human rights defender, he has fought tirelessly, and continues to do so, to ensure that basic human rights are upheld in the country. The late President Nelson Mandela, with whom George enjoyed decades of friendship, was one of George Bizos’ famous clients. Throughout his illustrious legal career, George has stood with those who resisted oppression and impunity and has taken on many high profile political cases including the Rivonia and Delmas Treason Trials. At the Truth and Reconciliation Commission, Advocate Bizos represented a number of families including those of Steve Biko, Chris Hani and the Cradock Four. He also led the LRC’s legal interventions on behalf of the families of those slain at Marikana: initiating the independent forensic work that exposed the horrors of the massacre and playing a significant role in placing evidence before the Farlam Inquiry into the killings. George was also a witness in the recent 2017 case that led to the High Court’s decision to set aside the fabricated inquest results that the apartheid regime had attempted to use to hide their murder of Ahmed Timol. He continues his tireless pursuit of truth, justice and human rights. Uncle George has been with the LRC for 27 years. He has served with the LRC with distinction; he has mentored and advised; he has worked as part of a team; he is a caring colleague and great friend. He has served the people of his adopted country, South Africa, selflessly with dedication and commitment. It is befitting that the LRC should launch the George Bizos Award and to do so in March, a month that has become known as Human Rights month. The LegalResources Centre is proud to be able to honour a struggle hero and one of theLRC’s own through this Award. South Africa’s constitution is only as strong asthe willingness of people to defend it. This can only happen when the benefitsthat people need and which the constitution promises are secured. It is thetireless efforts of people like George Bizos who work to make ourconstitutional promise our lived reality. Our past is still present in SouthAfrica and there is much to be done. Through this Award and the celebration ofthe person it recognises, we hope to further inspire people to embrace thepossibility of advancing human rights through their actions.